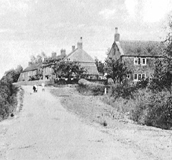 These pages are devoted to the local and family history of Dilton and Dilton Marsh. I hope to be able to bring together people who are researching the villages and make a resource for all who are interested in the villages and the people of Dilton and Dilton Marsh. These pages include my personal research on the area and families related to myself, also information provided by other researchers. If you have an interest in the Villages I hope that you find these pages of interest. Even better, if you have any information on the villages, photographs or family stories I would love to include them here. Please Email me if you can help. If you are researching a family or individual in the area, be sure to check out the List of researchers. These are all people who are researching families with links to the Villages. I have a microfiche transcript of the Dilton Baptism and Burial Records, transcribed by the Wiltshire Family History Society. I am willing to do look ups from that. Email me with reasonably specific information. You can purchase these transcripts in fiche or book form from the WFHS. Details are on their website. Don't forget to check out the researchers list - you might find a distant relative among the researchers there, or add the family names that you are interested in. I have added a postcard picture of St Mary's Church to the Villages section.